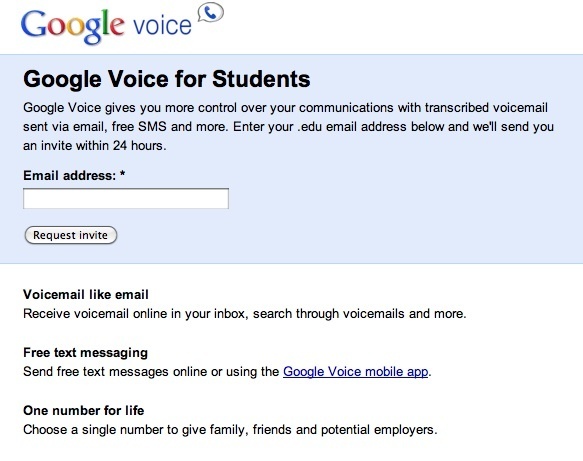 Google posted an offer to college students a few days ago, saying that they would receive Google Voice invitations within 24 hours. All you need is a .edu email address. Google Voice is best thought of as a lightweight operator for your own personal telephone exchange. Once you’ve set it up and created a new phone number, you can basically tell the system to direct calls to your various phone numbers (home, work, cell) depending on when they are placed and who they are from. And once you have the dialing party on whichever line you had specified, you can still access multiple controls, such as recording the call or switching to a different line.